Mr. George Rumpel occupied the mayor's chair very acceptably during the year 1898. The year previously he had been reeve. His term as Chief Magistrate was marked by the purchase of the water works system, which has proved Berlin's best public utility. Its purchase was opposed by many citizens and a heated compaign preceded its taking over. Mr. Rumpel has since served on both the Water Commission and the Park Board. He was born in Saxony, Germany and came to Berlin in 1871, and soon after established the Berlin Felt Boot Co. and has proved himself to be an able business man. As a citizen, he is esteemed for his many excellent qualities. George Rumpel, president of the Berlin Felt Boot Company, is numbered among the worthy Canadian citizens that Germany has furnished to the Dominion, his birth having occurred in Saxony on the 10th of May, 1850. His parents were Frederick and Fredericka (Rick) Rumpel, also natives of Germany, and the father was a furniture manufacturer of Saxony. In accordance with the laws of his native land, George Rumpel attended school between the ages of six and fourteen years and then entered business life as an apprentice to the shoemaker's trade, serving a three years term of indenture. He afterward traveled and worked as a journeyman for three years, being employed in twelve different factories after becoming a master workman. 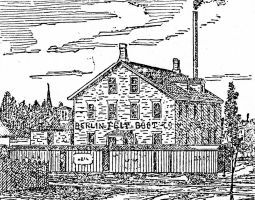 Hoping to enjoy better business opportunities in the new world, where wages were generally higher and competition not so great, he came to Ontario in 1871, settling in Hamilton, where he secured employment in the McPherson shoe factory. 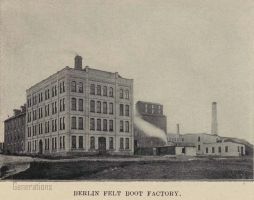 In 1875 he came to Berlin and for two years was in the employ of the Berlin Felt Shoe Company, while in 1879 he bought out the business, which he has since conducted. The enterprise is one of importance here, furnishing employment to about one hundred and seventy-five operatives. In this connection he carries on three factories and the plant covers an area of about ten acres, while the trade extends throughout the Dominion. The business has constantly grown and developed under the able management and keen discrimination of Mr. Rumpel, who has been watchful of every opportunity pointing to success and has utilized every means to the best possible advantage. He has kept his factory equipped with the latest improved machinery and he has always made it a point to pay good living wages, which has received from his employees faithful and valuable service. In 1872 Mr. Rumpel was married to Miss Minna Hartman, a daughter of the late Hans Hartman, who was a native of Saxony, Germany. Four children grace this union: Oscar, Olga, Walter and Hilda. Mr. Rumpel is a member of the Masonic lodge, the Royal Arcanum, the Maccabees tent and the Ancient Order of United Workmen. In politics he is a Conservative and has usually refused the public preferment offered him. He has, however, filled some local positions, being a member of the council for eight years, while in 1897 he was reeve and in 1898 was mayor of Berlin. During his administration in the last named position he succeeded in securing municipal ownership of the water works, which prior to that time had been operated by private individuals. He is now chairman of the water works commission and is a member of the park board, on which he has served as chairman for several years. He is likewise a member of the Board of Trade and has done effective work in behalf of public welfare and progress for a long period. He belongs to St. Peter's Lutheran Church, in which he is serving as deacon, and his humanitarian spirit is frequently manifest in his liberal contributions to church and to charity. His beautiful residence called Forest Hill, situated on King and Cameron streets, is considered the finest home in Berlin, while Mr. Rumpel has gained a position of prominence and distinction that justly entitles him to a place in this publication. Although his career has not been filled with thrilling incidents probably no life history published in this volume can better serve to demonstrate to young men the power of honesty and integrity, of diligence and perseverance in insuring success. Aside from his business interests his life has been actuated by unselfish motives, prompted by patriotism and guided by truth and justice. [S4] Vit - ON - Marriage Registration, 016143-00. [S137] Census - ON, Waterloo, Berlin - 1901, Berlin (Town/Ville) A-9 Page 8. [S158] Census - ON, Waterloo, Berlin - 1881, Div 1 Page 26. [S340] Census - ON, Waterloo, Berlin - 1911, Div. 30, Pg 2. [S1592] Census - ON, Waterloo, Berlin - 1891, Section 3 Page 49. [S1535] Report - An Inventory of Industrial Buildings of Architectural/Historical Significance in the City of Kitchener, p. pg 18. [S1775] Berlin: Celebration of Cityhood. [S1535] Report - An Inventory of Industrial Buildings of Architectural/Historical Significance in the City of Kitchener, p. pg 10.